Be our guests in beautiful Gore Bay, Manitoulin Island! 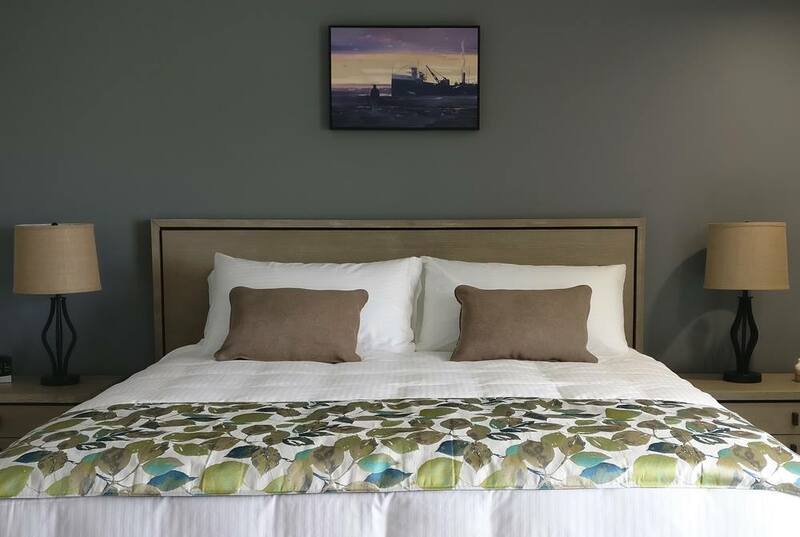 Whether you are looking to stay with us in one of our beautiful rooms, relax and recharge or looking for a home base while you explore the island, we have something for everyone to experience. Our 10 waterfront rooms have been lovingly refurbished, to maximize our guests’ relaxation and enjoyment of the Inn’s natural setting. Ground-floor patrons have access to private patios, while second-floor rooms feature individual balconies with outdoor seating. All accommodations are appointed with comfortable seating to savour the gorgeous waterfront views. Breathtaking sunsets are included, weather permitting, of course! We have 9 king-size beds and 1 queen size bed, all with a waterfront view, an attachable bathroom, television, and a mini fridge. Each room is tastefully decorated with 5 rooms on the ground floor with a walk-out patio, and 5 rooms on the second floor with a balcony view. Having An Extra Guest? Our rooms have one king size bed and can hold 2 people. If you have a baby, child, or an extra guest we have the options to add a roll-away bed or a play-pen-$20 plus tax. Wheel-Chair Accessible Room: We have one wheelchair-friendly unit on the ground floor, including a fully-accessible washroom, walk-in shower and a queen size bed. Please specify if this is a requirement. All rooms have complimentary WiFi and cable television, with a small refrigerator, hair dryer, toiletries and robes offered for your convenience. Take a beautiful stroll on the boardwalk before checking-in at 4:00pm. Note: If you require a late check-in, after 8:00pm, please make arrangements with us by calling 705-282-3375. Please note, breakfast is not included in your winter stay. Please ask our front desk for breakfast spots in Gore Bay.